Unlimited Calling Plans to India : Monthly Rentals Plans by IndiaLD | Free Pc to Phone Calls, Free Voip Calls to India International ! If the call rates are low, offered call quality is high, customer support is good then Unlimited monthly calling Plans are supposed to be the best plans. Specially when you are making international calls very frequently. Say you are an student or a professional living in USA and your friends and family live here in India. You obviously will like that you can talk to your parents daily, connect with your loved ones in India as frequently as you can. Well buying a Pay as you go (prepaid) calling card can help you in this case but then you have recharge your calling card time to time, call rates are comparatively high, and there is no such thing called "unlimited" ! This is where IndiaLD Voip Service can help you out. 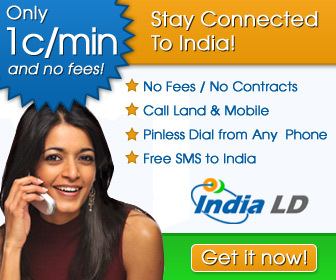 IndiaLD offers you one of the industry best, cheapest unlimited calling plans to India. These are simple monthly rental calling Plans to India, where you pay a monthly fees and get some free minutes depending upon the plan you choose. Apart from offering the monthly rental plans IndiaLD also offers pay as you go option, where you can call India at 1.5 cent per minute. If the person you are calling has Aircel Mobile, then IndiaLD offers some of exclusive deals. IndiaLD is the best voip provider if you are calling Aircel Mobile in India. Lets discuss the details of these unlimited calling plans. Get 3000 Minutes Of Calling To India For Just 1¢/min With The IndiaLD 3000 Plan. Get 2000 Minutes Of Calling To India For Just 1.3¢/min With The IndiaLD 2000 Plan. Get 1500 Minutes Of Calling To India For Just 1.3¢/min With The IndiaLD 1500 Plan. Get 1000 Minutes Of Calling To India For Just 1.4¢/min With The IndiaLD 1000 Plan. Get 500 Minutes Of Calling To India For Just 1.4¢/min With The IndiaLD 500 Plan. IndiaLD Aircel Exclusive Calling Plans to India : "Aircel Connect"
Aircel Connect is an exclusive partnership between Aircel and IndiaLD. Through Aircel Connect IndiaLD offers unlimited calling plans to India, and the ability to link IndiaLD accounts to Aircel mobiles in India for calling the US & Canada. Add Aircel Mobile Numbers To Your IndiaLD Account. Dial Short Code 59778 From Your Aircel. No Air Time Charges! At The Prompt, Call A USA Or Canada Phone Number. Don’t lose touch with that special someone! The good thing about IndiaLD is their customer support, which you can find online most of the times. So if you are having any query or if you are confused in deciding the plan just talk to customer service. Alternatively, you can post your concern here and we will try to answer ! Time to check out IndiaLD Voip Service. Aircel's calling plans are amazing. Cheap, affordable and a lot of variety. I started 1 to 1 Aircel Unlmtd plan, I can make calls from USA, but from India they can't call me... The customer service is providing lot of different solutions, but none of them worked yet ! Did it work with others?